If you read my last post, you’ll have learned a little about my dad Greg Brooks and his early life. Today I am going to talk about the first “treasure hunt” that my dad went on. It was a happy accident, and led to the start of what would eventually become Sub Sea Research. In the year 1984, my parents had been married for three years and I was not born yet. My dad’s friends Mel Corey and Joe Cooper were going on a dive trip to Haiti, and approached my parents in hopes that they would come along. Haiti may seem like an unlikely place to have a successful underwater adventure, but back then it was considered “virgin dive terrain” and with its tropical conditions and clear Caribbean water, it was really the perfect place to swim under the sea. 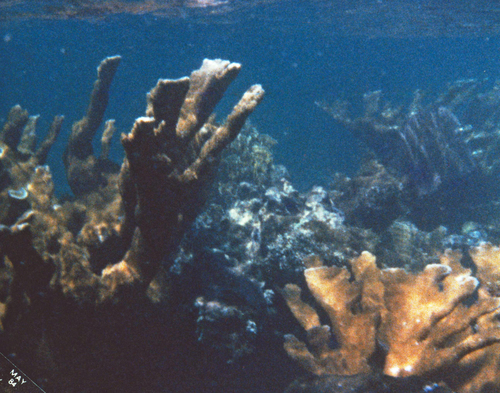 (The photo above is from 1984 and shows a reef in Haiti, much like the one explored on the dive trip). Despite the perfect conditions of the sea, in the 1970s and 80s, Haiti was under the dictatorship of Jean-Claude Duvalier, who was known as “Baby Doc” (his father “Papa Doc” had been the country’s leader until his death in 1971). Under his regime, Haiti was in a state of civil unrest. Violence was commonplace, and many Haitians were killed or tortured for speaking out against Duvalier, or even just being in the wrong place at the wrong time. The Duvalier family’s militia, known as the Tonton Macoute – a name that represents a child-snatching boogeyman in Haitian culture – kept the country under strict discipline. They carried machetes around the island, attempting to keep people in “order”. The early to mid 80s were probably the best time for Americans to be in Haiti, though it was still extremely dangerous. During Ronald Reagan’s presidency, the United States and Haiti’s strong anti-communist stances united them, albeit briefly. On the 1984 dive trip, while swimming through a reef, my dad discovered a silver bar. While fascinated, he did not dare to take it, because such an offense would surely result in detainment or death had he been found out. Instead, he hid it as best he could and decided he would return later, when or if Haiti was under less strict control. Sure enough, in 1988, after Duvalier had been thrown from power and exiled, my dad returned to Haiti. The bar was still there. He spent the next five years figuring out how to search for treasure full-time, and began negotiating with Duvalier’s successor, President Aristide. Finding that bar sparked something in my dad – the possibility of what could be out there, waiting to be discovered, in the unexplored terrain of the sea.